Syfy’s new Battlestar Galactica prequel—more futuristic family saga than space opera—is a provocative, superbly crafted drama that, like its predecessor, tackles complex, highly resonant themes, such as religion, race, terrorism, technology, love, and the very nature of humanity. Like all quality drama, Caprica is not just emotionally and intellectually gripping, but also compels viewers to confront their own reality, even as they are swept up in this visually arresting, preapocalyptic world of sentient robots, avatars, and interplanetary travel. The Paley Center will preview an upcoming episode from Caprica’s first season, followed by a discussion with members of the cast and creative team. Paley Center Members: $15, tickets on sale now. General Public: $25, tickets on sale Wednesday, February 24 at noon. Sasha Roiz shares with Show Patrol Blog an incredibly detailed history of Sam Adama's tattoos, as written by CAPRICA's writer/producer Jane Espenson. Impressive! BSG/CAPRICA executive producer David Eick gave WGA West an interview. New video: "Hackers Interrupt Buccaneers Promo" - don't miss a single thrilling centum! SciFiWire led us to two new clips in the SyFy player for this Friday's episode 104, "Gravedancing." What a way to start your day, huh? 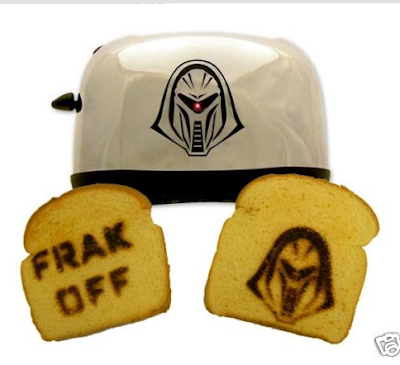 Maureen Ryan's Haiti Charity Auction continues to add new TV promo items -- this week another great BSG piece: The Frakkin' Toaster. Bidding is open until February 16. Mo tells us there will be one or two more BSG items coming up soon as well! Friend of Sitrep Maureen Ryan is running an Ebay auction to raise money for Haitian earthquake relief, and has put up for sale a ton of great BSG materials that she has collected during her years as tireless TV journalist. There are a bunch of BSG-related items (here, here and here) -- but the grand prize for our fandom is definitely this Season Two DVD set signed by Ronald D. Moore, David Eick, Mary McDonnell, Edward James Olmos and Jamie Bamber.